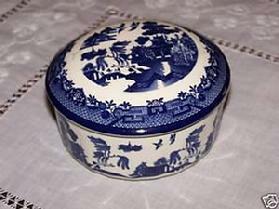 The Willow pattern, or commonly "Blue Willow", is a distinctive and elaborate pattern used on pottery, ceramic, and porcelain kitchen/housewares. The pattern was designed by Thomas Minton around 1790 and has been in use for over 200 years. Other references give alternate origins, such as Thomas Turner of Caughley porcelain, with a design date of 1780. 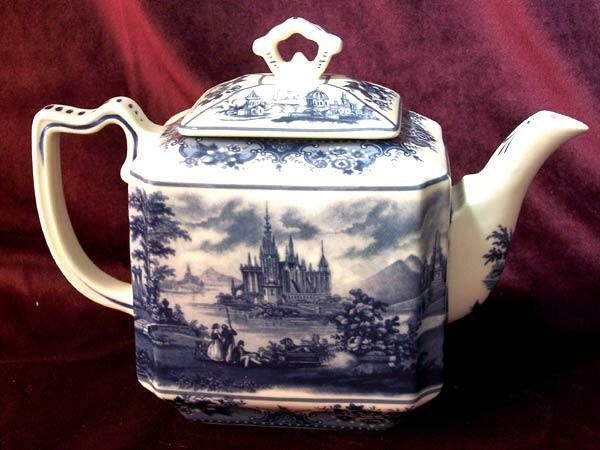 Willow refers to the pattern, a specific treatment, either applied transfer, or stamp, known as transferware. Background color is always white, while foreground color depends on the maker; blue the most common, followed by pink, green, and brown. Assortment, shape and dates of production vary. No one knows the exact origin of the Willow legend. Some say the Willow pattern legend was invented in England over 200 years ago to promote pottery sales of Minton's original willow pattern derived from an older Chinese design. The story usually runs as described below (with the frequent references to the figures in the plate design omitted). According to some, the original Chinese pattern Minton based his design on had no bridge with people on it, leading to doubt as to whether the stories connected with it came from China or England. Others say the legend was told in China more than a thousand years ago and brought to Europe from Eastern lands by the Crusaders. Regardless of the origin, the story, with variations, persists. The Chinese History: Willow plates are said to be a pictorial way in which members of the illegal Hung Society defied the Manchu rulers, whom they characterized as invading tyrants. Members of this illegal secret society celebrated their dead whom they called martyrs and reminded Hung members of their pledge to defend what they called Chinese and Buddhist values. 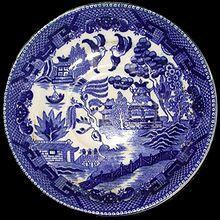 It is claimed that the Manchus destroyed all the original Willow Pattern plates. The design was supposedly smuggled into England in the 18th Century and reintroduced back into China in the 19th Century. 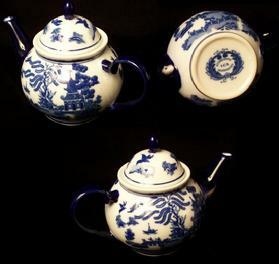 Commercial production of the Willow Pattern is made by Famille Rose porcelain. The Romantic Fable: Once there was a wealthy Mandarin, who had a beautiful daughter (Koong-se). She had fallen in love with her father's humble accounting assistant (Chang), angering her father (it was inappropriate for them to marry due to their difference in social class). He dismissed the young man and built a high fence around his house to keep the lovers apart. The Mandarin was planning for his daughter to marry a powerful Duke. The Duke arrived by boat to claim his bride, bearing a box of jewels as a gift. The wedding was to take place on the day the blossom fell from the willow tree. The Secret Shaolin Message: The Shaolin Monastery is burned by the Imperial troops of the Manchu rulers, called invaders by Chinese nationalist and later communist factions. Souls of the dead monks take a boat to the isle of the Blest. On the bridge are three Buddha awaiting the dead souls: Sakyamuni, the Buddha of the Past; Maitreya, the Buddha of the Future; and, Amitabha, the Ruler of the Western Paradise. Beyond them is the City of Willows � Buddhist Heaven. The doves are the monks' souls on the journey from human to immortal life. The teller narrates the tale while pointing to various designs on the plate. Cultural impact of the story: The story of the willow pattern was turned into a comic opera in 1901 called The Willow Pattern. It was also told in a 1914 silent film called Story of the Willow Pattern. Robert van Gulik also used some of the idea in his Chinese detective novel The Willow Pattern.